The US-Russia proxy war in Ukraine is escalating. The US, determined not lose its five billion dollar investment in the overthrow of Ukraine, has sent a guided missile destroyer to the Black Sea and just now enacted anti-Russia sanctions. Russia, protecting oil pipelines, military assets, and ethnic Russians in Crimea, is deploying anti-ship missile systems. We have ethical crises and conundrums on both sides (with the Russians facing severe economic and potentially humanitarian damage and the US facing a setback in its ceaseless expansion). 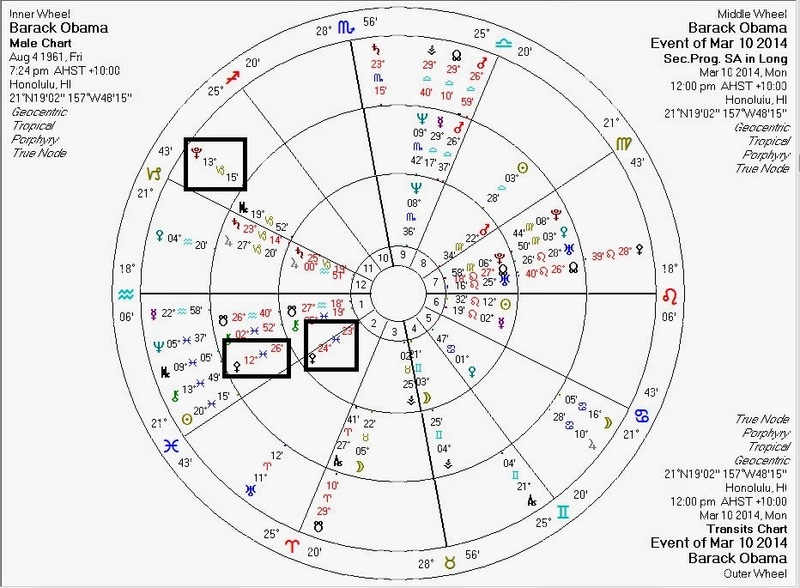 We can expect to find transiting Pluto aspecting the natal and/or progressed Pallas of the parties involved. For the Russian Pluto-Pallas transit, see this post which still applies. 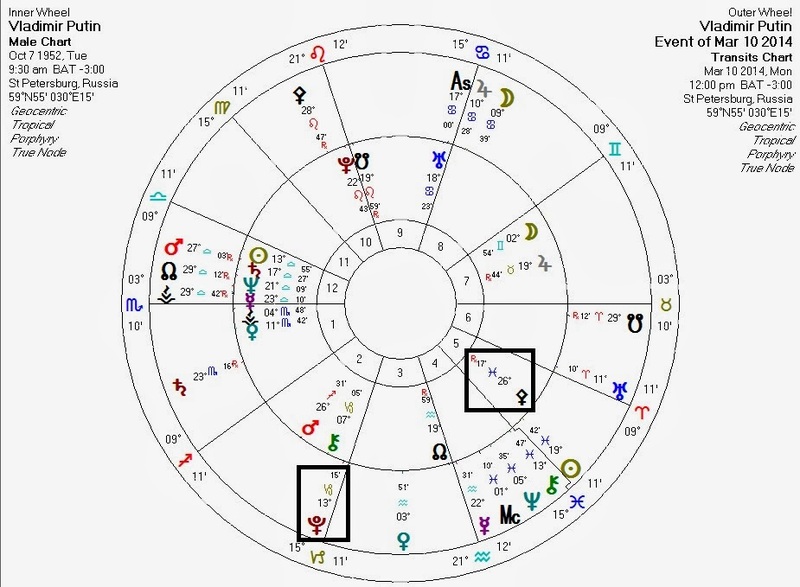 Of all of these Pluto-Pallas transits, Barack Obama's are the strongest: of the parties surveyed here, he is the most likely, both natally and by transit, to behave destructively and unethically. 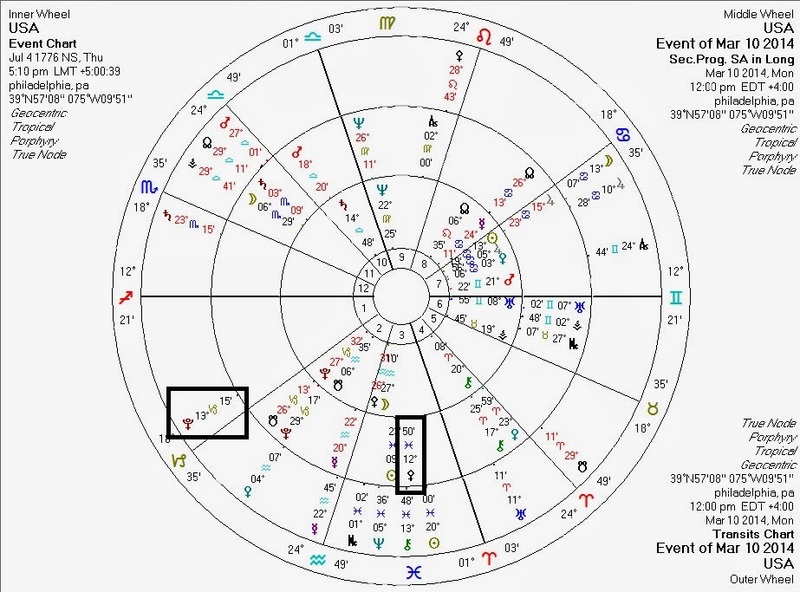 Transiting Pallas will exactly conjoin his natal North Node in a week, however. One hopes that he will then experience one of his rare moments of good judgment, and take steps to allow for Crimean secession. Secession (with or without Russian annexation) is probably the only peaceful solution now that US-funded anti-Russian fascists now control Western Ukraine.